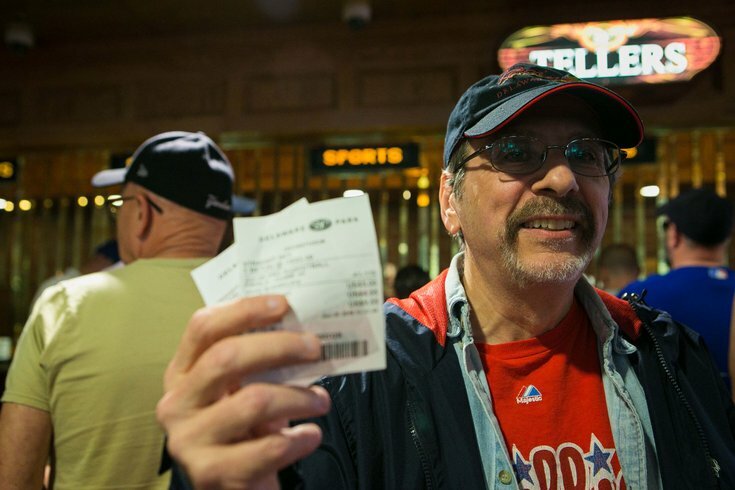 Jerry Petti of Pike Creek shows his ticket after making a bet at the Casino at Delaware Park in Stanton, Del. At 1:30 p.m. today Tuesday, June 5, 2018, Delaware launched the country's first full-scale sports betting operation outside of Nevada. A few weeks ago, shortly after he flew into Philadelphia from Las Vegas, Joe Asher was standing in an area Wawa waiting for his hoagie to be made, wearing a long-sleeve Las Vegas Golden Knights t-shirt. Noticing the out-of-town attire, a Wawa delivery driver struck up a conversation about Vegas with Asher, a former Wilmington, Delaware resident and University of Delaware grad. The driver had no idea what Asher did for a living. The pair chatted for 10 minutes, with the driver explaining how he used to bet with a bookie, before Asher picked up his sandwich for the trek to Atlantic City. But what the driver didn’t know is that the man he was just chatting up is actually the CEO of William Hill US, the U.S. arm of the powerful British bookmaking giant William Hill. What the driver also didn’t know is that he may not be placing a legal bet any time soon in Pennsylvania. After the U.S. Supreme Court legalized sports betting on Monday, May 14, in the ruling Murphy v. National Collegiate Athletic Association, No. 16-476, there were eight states — New Jersey, Connecticut, Pennsylvania, Delaware, Iowa, New York, Mississippi and West Virginia — that had a head start, with laws prepared to make sports betting legal. Thirteen other states — California, Illinois, Indiana, Kansas, Kentucky, Maryland, Massachusetts, Minnesota, Michigan, Missouri, Oklahoma, Rhode Island, South Carolina — have plans or proposals to consider legalizing sports betting in place. For sports fans looking to place a wager or two in Delaware or New Jersey, this is a good thing — starting this week. For the poor truck driver in Pennsylvania, however, it looks like he’ll have to cross state lines to place a legal bet — or continue business with his bookie. Under federal law, legal sports books pay a 25-percent point of the amount wagered, which translates into about five percent of the revenue every month, according to Asher. That federal tax is across the board. In Nevada, the state tax for sports betting, which is a sliding scale, is roughly six percent of monthly revenue, which amounts to roughly 11 percent total (including federal taxes). In New Jersey, the monthly retail level state tax is expected to be less than 10 percent, with the online tax possibly slightly higher. Coupled with the five percent tax to the feds, the total government take comes out to roughly 15 to 16 percent. In Pennsylvania, however, the monthly tax is expected to be an astronomical 36 percent at the state and local level — 34 percent to the state and two percent to local municipalities. Add in the federal tax and it totals a whopping 41 percent. Pennsylvania is also charging a $10 million licensing fee — for the privilege of paying 41-percent, as spelled out in Act 41, which was passed by the Pennsylvania State Legislature in October 2017 in anticipation of the U.S. Supreme Court legalizing sports wagering. So, is there any chance this works? “The problem is that it makes it very hard for the legal market to compete with the black market, to compete with the illegal bookies in Pennsylvania,” Asher explained. “Sports betting is widespread in the area. I know it because I grew up around it. My dad used to bet with his local bookie ‘Tony Franacas,’ who had a little place on 8th and Orange Street in Wilmington, Delaware. You have this well-entrenched and established illegal market in Pennsylvania. “Clearly, we want to try and migrate people away from that, but I can’t see how you can realistically do that, given the tax structure. Because here’s what’s going to happen: The Tony Franacases of the world are going to say to say to guys like my dad, ‘Listen Larry, don’t worry about betting at the casino, I’m going to give you a 25 percent rebate on all of your losses at the end of the year. So if you lose money, we’ll give you 25 percent back.’ If a bookie does that, he still has a 16-percent percentage-point advantage over us. He’s not playing the $10 million up front, he doesn’t have all of the infrastructure costs that we do. The legal market in Pennsylvania could be very small — smaller than it should be — because of this tax rate ... it will be very hard to compete with the bookie. William Hill US, which has 107 locations and is far and away No. 1 in the Las Vegas market, will be opening a sports book in Monmouth Park racetrack in New Jersey. On June 28, it will be opening another at the Ocean Casino in Atlantic City. And it's already the the risk manager for the Delaware Lottery. But one of the things William Hill US hasn’t done yet is to make any steps towards opening a book in Pennsylvania —because of the tax rate and licensing fee. In Las Vegas, the licensing fee is $500. That's a cool $9,999,500 less than it will be in Pennsylvania. In New Jersey, Asher predicts the licensing fee won’t come anywhere close to $10 million, which presents a further problem for sports books looking to open in the Keystone State. “It’s a problem, a real problem,” Asher said. “In New York, I’m hearing it’s going to be around 10 percent, or less. And that’s New York. Then, you have five percent to the IRS. Every other state — West Virginia, Mississippi, it’s around 10-percent. Pennsylvania is the outlier, and understand that Pennsylvania has a high casino tax rate. This is different, because you don’t have underground casinos. What you do have are illegal bookies. Instead, much of the focus has been on New Jersey, which has been at the vanguard in the push toward legalizing sports betting nationwide. In 2011, New Jersey voters passed a constitutional amendment in favor of legalizing sports betting. Three years later, the Legislature repealed its law against sports betting. Both were challenged in court. But now the Legislature only has to pass a law establishing the rules and regulations for sanctioned sports betting to begin at casinos and racetracks in the state. After six years of litigation, and seven losses in the lower courts, New Jersey struck the one major decision that mattered — in the U.S. Supreme Court. Asher said William Hill US is plunging millions into their sports book operations in New Jersey, a market Asher predicts could be twice as large as Nevada’s, which saw $5 billion in legal sports betting last year, according to UNLV’s Center for Gaming Research. Americans illegally wager $150 billion on sports each year, according to the American Gaming Association estimates, and 32 states are expected to jump into the legal game within the first five years. “It’s killing me not to do something in Pennsylvania, because, look, I grew up in the area, I love the state and Philadelphia, and I’m a lifelong Eagles and Phillies’ fan,” Asher said. “I can guarantee you Tony Franacas, who if he was alive, would be 120 right now, wouldn’t be paying $10-million for a licensing fee, I can tell you that.